“Are you alright? Haven’t seen any new posts for a while…” This earnest email popped into my email inbox a couple of days ago. The guilt that had been gnawing at me since my last post came bubbling up to the surface. I am so sorry I disappeared without even a squeak. But I have a very legitimate excuse, several actually, really! It’s been a whirlwind of events these last two months. First, my sister was getting married. Not only was I lady of honor (who knew there were so many responsibilities associated with the title, not to mention official skirt fluffer on the day of the wedding), I also spent several days baking 150 wedding cupcakes in three different flavors: strawberry, pandan, and chocolate in addition to entertaining overseas relatives and friends, and other miscellaneous sister-of-the-bride duties. Second, we upped and moved from Seattle, Washington to Pacific Grove, California on the Monterey Peninsula. We now live in a little pink cottage with a gorgeous view of the bay from our deck! It’s smaller than our last place but downsizing and purging are great for one’s sanity. I’ve been pottering around my new kitchen and cooking some of the fabulous recipes I’ve gathered for my cookbook. The light-filled space is nice and open, and I was so happy to go from electric to gas, and oh, the stove is actually on an island! And third, my manuscript was due. But the good news is, I finally handed in my manuscript last week. Woohoo! But I shan’t get too relaxed as edits will soon come round. 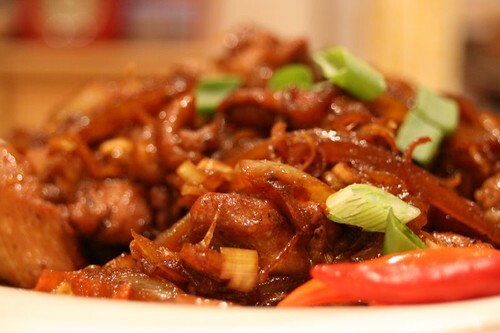 Here’s a delicious Vietnamese chicken recipe as a piece offering. The subtle, citrusy scent of lemongrass, the bittersweet flavor of caramel, and the heat of red chilies marry very well with chicken in this popular Vietnamese dish. Every Viet cook has his or her own recipe–this version comes from Huong Thu Nguyen. In her words, “It takes a while to make good caramel sauce without burning it,” so keep practicing! You may be tempted to use chicken breast instead of thighs as well as remove the skin. Please don’t. Thigh meat is juicier and more succulent and the skin has tons of flavor, all of which add to this delightful dish. Trim the lemongrass and bruise the stems with a meat pounder or a large knife to release their aroma and oils. Cut into thin ringlets and whirl in a food processor until ground to confetti-sized flakes. Repeat with the remaining stalks. You will get about 3/4 cup (12 tablespoons). In a medium bowl, season the chicken with salt and 1/4 teaspoon black pepper and toss together with 3 tablespoons of lemongrass flakes. Set aside. In a large skillet (if possible, use a pan with a light interior such as stainless steel so you can monitor changes in color), heat the oil over medium-high heat until it becomes runny and starts to shimmer. Add the sugar and stir continuously. After 1 to 2 minutes, the sugar will start to clump together then melt into syrup. After another 2 to 3 minutes, the clear syrup will thicken into a gooey caramel-brown liquid suspended in the oil. You will also smell a pleasant burnt sugar aroma. Watch the caramel closely during this process as it can burn very quickly. 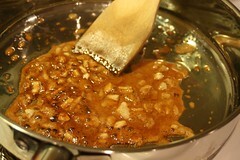 If the caramel starts to turn black and smell acrid, pull the skillet off the stove for a few seconds before continuing. Don’t let the caramel sauce get any darker than this. Stir in the remaining lemongrass, onions, and 1 tablespoon garlic, and cook and stir until the ingredients turn golden brown and fragrant, about 1 to 2 minutes. Add the chicken and raise the heat to high. Toss the chicken in the caramel sauce for about 1 1/2 minutes. If there isn’t enough sauce to evenly coat the chicken, carefully add water, 1 tablespoon at a time. If the mixture starts to sputter aggressively, pull the skillet off the stove until it ceases. Throw in the chilies and keep stirring until the chicken is no longer pink, about 2 to 3 minutes. When the chicken is just cooked through, add the fish sauce and remaining garlic. Stir with a couple more flourishes to mix well. Taste and adjust seasonings if desired. Remove from the heat and transfer to a serving platter. Sprinkle with black pepper to taste and garnish with chopped cilantro leaves and green onions. Serve with freshly steamed rice. write in my diary on a daily basis. I’d like to start a blog so I can share my own experience and thoughts online. anything entirely, however this article provides nice understanding even. website. I’m hoping to check out the same high-grade content from you in the future as well. What a busy summer Pat! Your new home and VIEW sound fabulous and congrats on getting one step closer to your book. Can’t wait for it to hit the blogging waves, we’ll be one of the first to cook from it for sure! Congrats on finishing the book, Pat! And I’m glad to hear that purging and downsizing are good for the soul. We’ve got a bit of that in our near future and I’m not looking forward to it! Aw shucks, you guys. Thanks for the warm welcome back. Annalisa, I wish PG were as warm and sunny as S. California! Tuty, thanks for the nudge :). Marvin, hope you enjoyed your break in the Philippines as well. Jon, thanks for the recommendation, everyone loves Passhionfish! Christina, try out the recipe sometime. It’s totally yummy! What a fantastic recipe! I never would have thought of that combination. I definitely have to try it out. Glad to see you back and that you’re enjoying your new home – it sounds lovely. congratulations on the move. We’ve missed you. I am jealous of your location. The region is wonderful. Be sure to visit Passionfish. One of the best places to eat anywhere with a wonderful wine list. Nice to see you back, Pat! It’s funny you posted this as I was just thinking of shooting you an email a few days ago. But I figured you were busy with the move and cookbook, but maid of honor too?!! It’s a much deserved blogging break for you, I think. Anyways, glad your back, and it’s very exciting that your manuscript is done. Hopefully the edits will go smoothly! I’m so glad you’re back! Congrats on the new house, I’m from Southern California (now living in Arizona) and I miss it SOO much! This recipe sounds very different, yet easy to prepare. I’ll have to try it for some visiting in-laws this weekend!